L to R: Red Deer Deputy Mayor Frank Wong, MLAs Barb Miller and Kim Schreiner, and Darren Young. 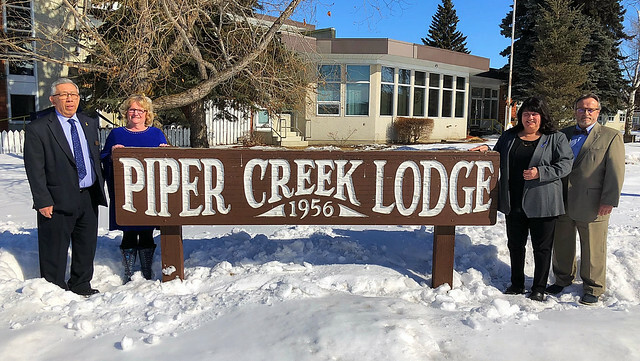 On behalf of Seniors and Housing Minister Lori Sigurdson, Red Deer MLAs Kim Schreiner and Barb Miller announced a $28-million capital investment to build a new 100-unit complex to replace Piper Creek Lodge, built in 1956. Piper Creek residents can remain in the original lodge while the new facility is under construction at a site about half a kilometre away. The new building should be ready for seniors to move in by spring 2021.